1 lb. apples, peeled and sliced to about 1/4 in. 1 lb. apples, peeled and sliced to about ¼ in. Heat oil over medium heat in a large sauté pan or cast iron skillet. Pat pork chops dry on both sides; place in pan and cook until brown and cooked through on each side or until internal temperature reaches 145 degrees. In another skillet, melt butter over medium heat. Add onion and garlic, sauté until soft. Next, add brown sugar and cook for 1 minute, or until it begins to melt. Add chopped apples, and sauté over medium heat until the apples are browned and tender. In the pork chop pan, add apple cider and cook over medium heat until the liquid is reduced by about half. Add the cream and bring to a boil. Allow it to bubble for a few minutes until sauce is slightly thickened. Sprinkle with fresh rosemary, and season with salt and pepper as desired. 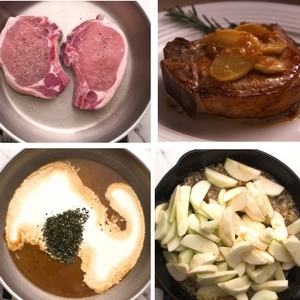 When serving, garnish with a spoonful of caramelized apples and cream sauce on top of each pork chop.